Marek Kwiek, „Building a new society and economy: high participation higher education in Poland” (1-23). Brendan Cantwell, Romulo Pinheiro, and Marek Kwiek, „Governance” (1-26). Dominik Antonowicz, Brendan Cantwell, Isak Froumin, Glen A. Jones, Simon Marginson and Rómulo Pinheiro, „Horizontal diversity” (1-20). The world enrolment ratio, now rising by 10 per cent every decade, is approaching 40 per cent, mostly in degree-granting institutions, including three quarters of young people in North America and Europe. Higher Education systems in the one in three countries that enrol more than 50 per cent are here classified as ‚high participation systems’. Part I of the book measures, maps, and explains the growth of participation, and the implications for society and Higher Education itself. Drawing on a wide range of literature and data, the chapters theorize the changes in governance, institutional diversity, and stratification in Higher Education systems, and the subsequent effects in educational and social equity. 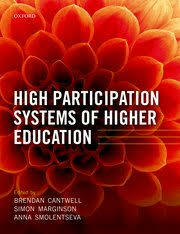 The theoretical propositions regarding high-participation Higher Education developed in these chapters are then tested in the country case studies in Part II, presenting a comprehensive enquiry into the nature of the emerging ‚high participation society’.